Twenty-two-year-old Alex Smith is a serving soldier in the British Army who nearly went into a very different profession - ballet. For two years he kept his talents a secret from his fellow soldiers. Trooper Alex Smith of the Queen's Dragoon Guards is wearing his uniform and he's ready for duty. But today, unusually, he's in a theatre. 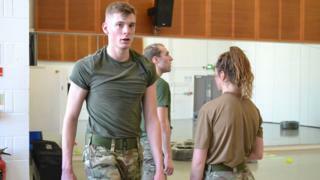 Alex is appearing in a contemporary dance production called 5 Soldiers, a work created by choreographer Rosie Kay about all aspects of military life - the rigorous training, the friendships and the stress of going into conflict. As a trained soldier, Alex has first-hand experience of what life is really like in the British Army - and yet he is also a trained dancer, having studied ballet, tap, jazz, modern and contemporary dance. "I started dancing when I was six years old," he says. "Every week it would be dropping my sister off to dance classes and after a while you are just sitting there and you're bored and you're just like, 'Aww, let me do something.' And then I watched one of the classes and I thought, 'I could do that, it looks so easy.' So that's why I joined." Growing up in the rugby-playing town of Cwmbran, Torfaen, Alex often found himself the only boy at dance class. "Male dancers want to jump higher and spin faster and look better than each other on stage. But because my school was in south Wales, there were hardly any lads that wanted to dance. So the big aim for me was to be more flexible than the girls in class. That was one of the main things I wanted when I was younger." After a course at a performing arts school in Cornwall, Alex was awarded a place at the prestigious Northern Ballet School in 2015 - yet half way through the course, he decided to leave. "The thought of getting a job at the end was probably one of my biggest fears," he says. The life of a dancer can be an unstable one, going from one contract to the next, often with periods of joblessness. One evening Alex was walking home from dance school in Manchester when it occurred to him how to achieve greater job security. "I walked past an Army's career centre and I just looked into the window for two or three minutes and realised maybe that is the next step for me, the next window for me to go through to better myself as a person," he says. He says that, despite appearances, dancers and soldiers have quite a lot in common. Self-discipline is important in both cases, and a determination to succeed. "Dancers are very driven, motivated and they want to get the end product, they want to get that performance on stage that looks perfect. And then you've got soldiers who are dedicated, driven and they want to soldier to the highest of levels," he says. And both roles also require high levels of fitness - so Alex was well-prepared for the physical tests he and other applicants had to undergo. "I had probably the quickest run time on the day for the mile and a half," says Alex. "I think dance carried me through selection and then it carried me through basic training, because I was quite physically fit. I could carry the weight because I was used to lifting girls." At first Alex only told his girlfriend, a dancer, that he was applying for the Army. It wasn't until he was awarded a place that he told his mum he was leaving dance school and coming home. "Obviously she wasn't thrilled," says Alex. "Because all the hard work and everything that I'd put into the last 18 years of my life she said I'd thrown it away, but I don't believe in that statement because I think it's made me the person I am today and it's made me a better person." Alex says any parent who has a son or daughter in the armed services fears that they will one day be deployed to a war zone. But his mother has now accepted his new career, he says - and is delighted that he is now combining it with dance. When he joined the Army, he decided not to mention his dance training to the other soldiers, because he didn't want them to have any preconceived ideas about him. He didn't mention his audition for the role in 5 Soldiers either. All the other dancers there were professionals, so he didn't expect to get the role - and was shocked when he got a call from the choreographer on his way back to camp, telling him that he had been successful. The next morning he told his fellow soldiers all about it, revealing his hidden talent for the first time. "To be honest nothing really changed, because I'd already earned the respect of everyone, because I was fit and a good soldier and I kept my head down and I did what I had to do," he says. "So when I said, 'Oh by the way I'm going to do dance,' most of them were quite jealous." There has been no teasing, he says. "I think the army's changed since a few years ago," he says. "No-one will give you stick because you're all in it together, and obviously everyone has their own reasons for joining. "Some join to forget their past lives or some join to better themselves, like me, and so it's not like school, it's a very grown-up environment where you do what you want to do, as long as you get the task done at the end of the day. It doesn't matter what you do in your spare time or what you've done in your past life." At school it was very different, he says. There was "the odd idiot who thinks he's funny", as he puts it. "I went to a Welsh medium school and the teachers weren't much help, they just thought, 'Oh yeah, they're only having banter.'" Alex says this had an impact on his studies. "I wasn't really interested in learning. I just didn't want to be there," he says. "But since I'm older I don't care - people can say what they want. Everyone's got their own opinions, I don't have to care about it." In rehearsals for 5 Soldiers, Alex says he found himself using muscles that he hadn't used for a while. "While I'm here I'm still going for runs and we do warm-ups in the morning where we're doing press-ups, sit-ups and that sort of thing," he says. "I think I'll go back to the army a fitter soldier, to be honest." He says he's enjoying being a dancer again, but that the most nervous night of his life will be when some of his squadron come to watch him perform. "They're serving soldiers and I want them to feel as if it is real - as real as it is on camp," he says. "I don't want them to come in and go, 'Err I'm watching a ballet.' Because it's not a ballet, it's a piece of dance that's re-enacting the life of a soldier in camp and on tour. "The scene where we're patrolling around - in my head I'm feeling like, 'Yes I am on patrol and I'm working with fellow soldiers and not just working with four other dancers.'" He says the piece will also crush a few stereotypes. "It isn't just boys jumping around in tutus with pointe shoes on and makeup, it is men being men on stage." The Army has been very supportive, he says, giving him time off to take part in the rehearsals and the production. He will return to his regiment in July after the tour is over. "My ambitions at the minute are to go back and see how far I can take my soldiering career, see how far I can push myself, because I am a very ambitious person," he says. "I do work hard for what I want and if I want something I will try my best to get it, and I think the Army's instilled that in me from training." He is not sure yet, however, what the future might hold for him with dance, but is keen to find out if there are any other dancing soldiers out there. "At the moment I'm just trying to enjoy 5 soldiers and take everything on board and just live this dream, all that I've worked for for the last 18 years," he says. "I am just very appreciative that all the training that I have done, and all my teachers - which I am really thankful for - have been able to put me in this position." The Rosie Kay Dance Company's production of 5 Soldiers will be touring the UK, Denmark and the US.